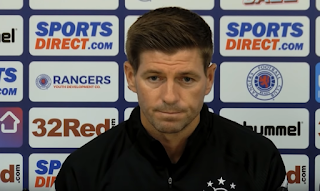 Ibrox Noise: Has Steven Gerrard just dropped a big hint about Jake Cooper? Has Steven Gerrard just dropped a big hint about Jake Cooper? As regular readers to Ibrox Noise over the years will know, one thing this site has paid close attention to is semantics. We take significant pride in our analysis of how our managers speak, and what they say – we meticulously pore through the wording, and flush out the contradictions. One of our favourites was Mark Warburton’s comical lies about weeks to ten days for pretty much every player who was out injured, and another was exposing Graeme Murty’s real allegiances when he described Celtic Park as ‘second to none’. The point is we pay attention, and that’s why, when Steven Gerrard spoke yesterday at his pre-Shkupi press conference alongside new signing Umar Sadiq, we were especially intrigued by how he addressed the Jake Cooper story. Fair enough we might think? In short, it appears if a player is a serious interest, Stevie may be prepared to discuss them, but if they’re not, it either gets flat out denial or a non-comment. Now this isn’t scientific, of course, and semantics are only the study of language structure and how we use words for specific purposes, but the two juxtaposing responses there to two different reported transfer targets are very revealing. Indeed, we discussed recently how Gerrard had dismissed six players as being interests (much to the vehement disagreement of some of you good readers), but the one he did admit was Sadiq. Lo and behold the rest have faded from press association and Sadiq sits in Govan. Cooper is one we’d like, and we will see if there is fire underneath the smoke, but it is nevertheless intriguing how differently Stevie G has addressed two transfer stories. I see no benefit in over analysing the words of the manager. What will be will be and what the players do on the pitch is ALL that matters. Could it be that Sadiq was always intended as a loan signing? Because we've made a (reported) bid for Jake Cooper as a permanent signing that Stevie G didn't want to comment and out any potential deal at risk? Course it could be that Roma had made it public that they wanted Sadiq to go out on loan whereas Millwall are desperate to hold on to Jake Miller. Who knows.